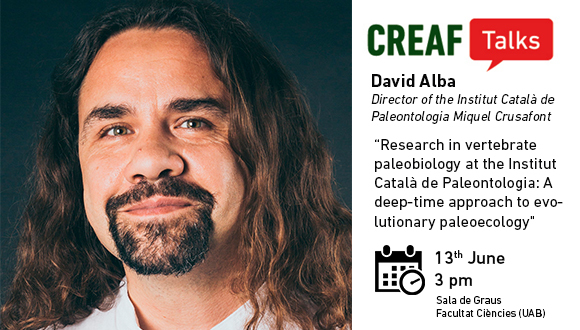 David Alba, Director of the Institut Català de Paleontologia Miquel Crusafont (ICP)-UAB. "Research in vertebrate paleobiology at the Institut Català de Paleontologia: A deep-time approach to evolutionary paleoecology"
The ICP is a CERCA research institute that aims to perform research in vertebrate paleontology at the highest international level. ICP research goes beyond classical descriptive paleontology and takes instead a paleobiological approach. The latter takes advantage of the access to deep time provided by fossils, in order to test hypotheses on evolutionary paleoecology at a geological timescale. In this talk, the history of the ICP and the aims and scope of its four main research lines will be briefly reviewed. Three aspects will be emphasized: (1) the quantitative analysis of paleobiodiversity dynamics, in relation to the interplay between faunal turnover and climatic change; (2) the investigation of life-history evolution under insularity conditions by means of paleohistological techniques; and (3) non-invasive imaging techniques applied to evolutionary and paleobiological studies on encephalization, diet and locomotion. Emphasis will be put on those research questions for which ICP and CREAF synergies could be generated or strengthened further. David M. Alba is a vertebrate paleobiologist and paleoanthropologist. He obtained his PhD in Biology (2005, UB) with a dissertation focused on ape evolution, and subsequently expanded his research interests into other vertebrates from the Neogene and Quaternary of Western Europe. He was BP postdoctoral researcher at the UAB (2004-2006) and RyC researcher at the ICP (2009-2014), made several stays abroad in Italy and the USA, and worked for two private companies devoted to applied paleontology. Since 2012, he leads the Neogene and Quaternary Faunas Research Group of the ICP, being mostly focused on the paleobiodiversity, phylogeny and paleobiology of Miocene terrestrial vertebrates. He has published more than a hundred papers in SCI journals (indexed by the SCR) and supervised several PhD dissertations. Currently, he is Editor-in-Chief of Journal of Human Evolution (Elsevier) and Director of the ICP.